This is a recipe that my mom made for us as kids. I have no idea where she got it but I am sure it was on the back of a soup can. It’s easy and perfect if you are craving comfort food and has become a staple in our house. 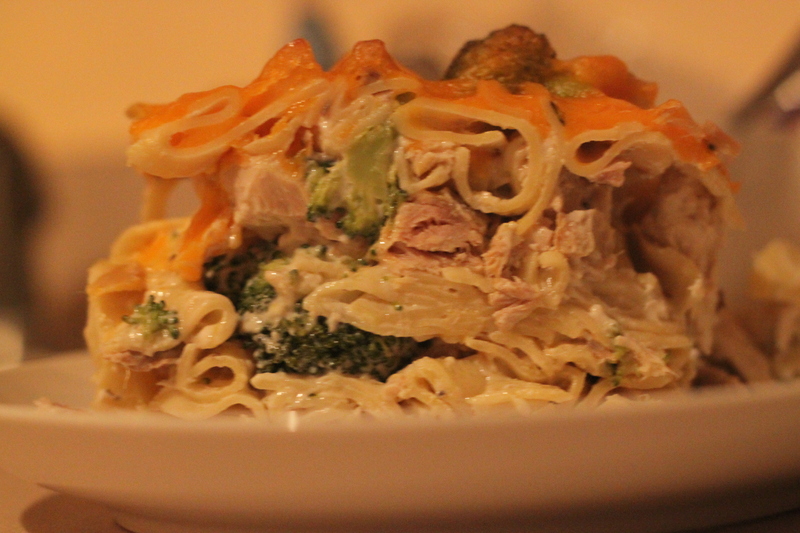 The prep for this dish is to have your chicken shredded, your broccoli steamed and your noodles cooked. Once you have done that, combine the sour cream and soup in a separate bowl. Mix well. Pour the soup mixture over your chicken and mix thoroughly….I find using your hands instead of a spoon works best. Lay your noodles in your baking dish. Next, put the chicken mixture on top. Then, you will place your chopped broccoli over the entire dish. Top with cheese and bake for 25 minutes at 325 degrees.